Isn't it awful that despite the number of hours a year I spend joyously wandering around the countryside, I'm embarrassingly ill-versed in certain sights and knowledge. Keeping my eyes open and learning as I go sounds like an obvious resolution for the new year. 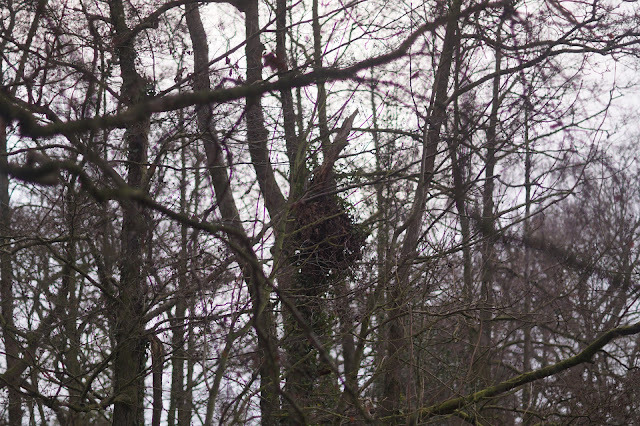 On Saturday, I was so excited to when we spotted this rather strange looking mess in a tree. The light was dreadful so after squinting our initial guess was that it was a giant, papery wasps nests. Upon closer inspection it became apparent that these were oak leaves and therefore it must be a squirrel's drey! 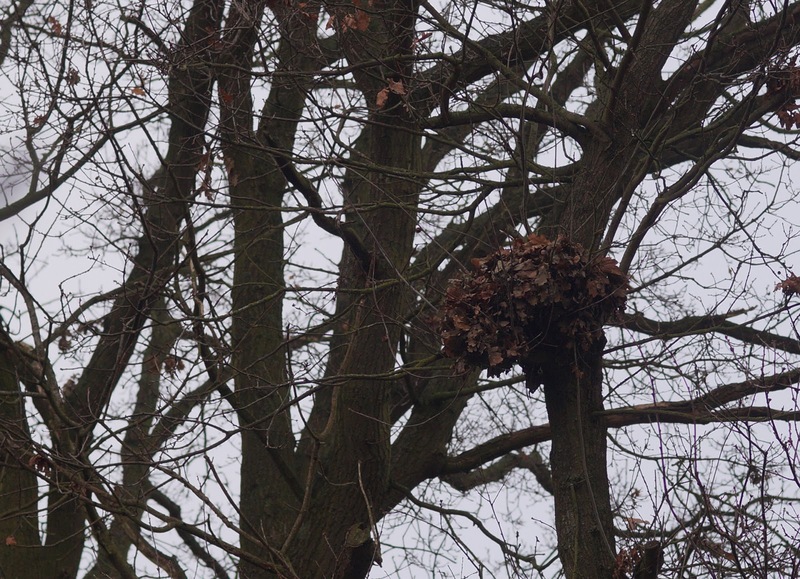 I've heard the term drey before but hand on heart, I'd never given much thought to how squirrels live and maybe assumed they just slept on a branch. Seeing this alarmingly fragile looking bundle of stuff on a branch was a surprise. It doesn't look very safe or sturdy... But nevertheless it's a squirrel house called a drey. Apparently there are summer dreys and winter dreys, but I don't know what this one qualifies as. Inside they are lined with moss, feathers, bark or dry grass. I don't know about you but I'd love to have a little peep inside and see exactly what's through the keyhole; maybe they've got some fancy knick-knacks furnishing their abode. After forever of not seeing one, I spot a SECOND drey in the same vicinity minutes later. Unbelievable. Un - be-lieveable. Anyway, I'm just going to say that I haven't seen a red squirrel in well over two decades and I suspect the warning signs in the Lakes to say red squirrels live there are wishful thinking. Despite keeping eyes peeled for any sightings we've not seen one on any of our visits. Such a shame. One final note; whenever I see a squirrel I feel the urge to whisper "should have bought a squirrel" as I've watched Rat Race so much (a film recommendation if you enjoy a good bit of comedy - it's oe of my absolute favourites). There are definitely red squirrels in Northumberland as I've seen them!! On a wander through the wood with Andy recently he said 'look, a drey', in all honesty I looked up expecting to see a bird. The shame! There are squirrels at Allan Bank, a national trust property on the outskirts of Grasmere in the Lake District. I watched them there this summer. They are fabulous little creatures.